The ideal blanket for changing weather conditions. This blanket functions as rain and fly blanket in 1. In addition, it also offers UV protection. The outer fabric is made of waterproof and breathable 600 denier polyester. The sides are made of polyester net material. 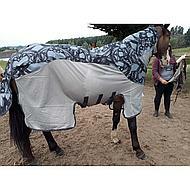 The blanket has a seamless design with a waterproof upper that prevents the horse from getting wet. The upper part is light enough so that the horse cannot get overheated. The net sides with Vamoose ensure maximum ventilation and protection against insects. The waterproof section has smooth polyester material which makes the horse shine. The blanket has a fixed neck, extra long tail flap, double coupling, front leg recesses, tail cord and 3 surcingles which protect the belly. Very nice blanket for the spring / early summer if there is occasionally a shower can fall and there are already annoying creatures. My horses never stayed fine with changeable weather under their covers. 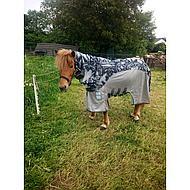 With this blanket they stay nice and cool / dry / protected and warm on the back without sweating. Very happy! Today I have the rain for the first time, so I can not yet assess whether the watertightness is good. I bought it for my eczema, to have a blanket that keeps it dry on rainy days and does not have to walk around with a wet eczema blanket all day long. I find the blanket very open around the neck / chest, so for bad eczemers may not be suitable. Unfortunately, you can not find an eczema blanket that is waterproof from above. I think the webbing on the belly flap is very long. Have them in the shortest and that is just / just not too long, depending on her bulging grass. Question: What is the difference Amigo 3 in 1 and Amigo three in one? There is a difference in price. Answer: The Amigo Three in one is a type from last year and the Amigo 3 in 1 is from this year.